Darren McCauley is set to complete his move to Inverness. DERRY CITY boss, Declan Devine has wished Darren McCauley 'good luck' with the Coleraine winger poised to complete his move to Scottish Championship club, Inverness Caledonian Thistle. Coleraine has accepted a bid from the Highlands club, managed by ex-Derry City boss, John Robertson, and having already agreed personal terms, McCauley is expected to fly out to Scotland to sign on the dotted line tomorrow morning (Friday). 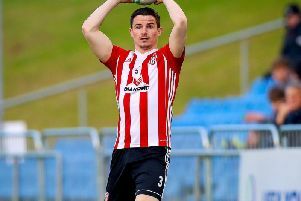 Having made, what he felt was, a fair offer for McCauley who had also agreed personal terms with Derry City, Devine said he was disappointed but wished the player well in the future. "I expect Darren to sign for Inverness," said the City boss. "I was happy with the offer we made for Darren. We had an agreement with Coleraine originally that if Darren was coming to Derry there wouldn't be a fee. "Then we offered a fee which had been accepted but the boy has obviously made his decision to go to Inverness," explained Devine. "Wherever the stories were coming from that we didn't offer a fee, they were wrong. When I spoke to Darren, we had agreed terms with him but now he's swaying towards Inverness which is fine, no problem. "We move on and there's no hard feelings anywhere along the line. The boy had options and if he pursues Inverness then we wish him good luck. "We've got another few targets we'd like to bring to the club over the next couple of weeks." Coleraine confirmed the player's departure in a statement this afternoon confirming McCauley has made the move to the Scottish Championship club 'for a nominal fee, subject to international clearance'. "Coleraine would like to thank Darren for his contribution and wishes him well in the next step of his footballing career."